Nancy believes that anyone can learn to be a creative hand-lettering artist by following a few simple steps and with a little bit of practice. Nancy writes a regularly featured lettering article for CardMaker magazine and is co-author of CardMaker's Hand-Lettering Workbook, published by Annie's. She has also served on many paper-craft product manufacturer design teams and has traveled around the United States teaching her love of all things crafty to students at craft conventions, retail stores and retreats. You can read more about Nancy, her creative endeavors and other adventures on her blog: NancyBurke.typepad.com. Learn how to draw seven creative lettering styles for card sentiments, scrapbook pages and more. 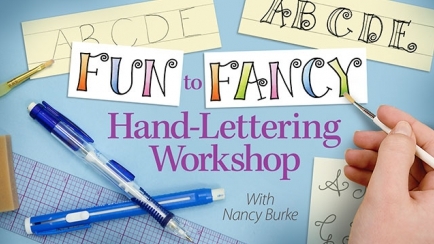 Hand-lettering expert and author Nancy Burke demonstrates each fun alphabet step-by-step!